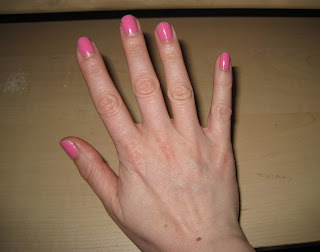 The Beauty of Life: Chipped Nail Polish: A Do or a Don't? Chipped Nail Polish: A Do or a Don't? In Thursday's New York Times, there was an article about chipped nail polish. In the article, entitled I Love What You Didn't Do to Your Chipped Nails, beauty industry insiders like nail polish guru Ji Baek of Rescue Beauty Lounge and Lancome's VP of Public Relations, Kerry Diamond (who, coincidentally, worked with this beauty chick at Harper's Bazaar back in the day) face off on whether this trend should stay or go. And while I believe a manicure should always look flawless, let's face it -- what beauty chick has time to run to the salon every time her polish chips? (Case in point: the picture at top left is, sadly, my week-old manicure.) In today's busy world, running around with chipped polish seems to have become a much more accepted way of life. The article discusses the ins and outs of this trend -- noting people that have even gone so far as to show up to interviews with less-than-perfect tips! (I would definitely never do that.) What's your take on the trend? Is it a do or a don't? Let this beauty chick know in the comments! I never seem to have a big problem with chipping polish... but I don't understand trying to trend-ify everything, lol! It doesn't look great, but maybe it should remain a fact of life, not a new fashion statement. If it looks like you're trying way too hard, I'd definitely say it's silly to do. It's a no no in my opinion...although my nail polish is severly chipped right now! I just never seem to have the time to freshly paint them! chris -- I can totally understand that! As evidenced by my chipped polish, sometimes it's better to have bare nails than chipped color. thedailyobsession -- The color on my nails is Essie Forget Me Nots. I had just gotten it done at the Bliss spa right before I saw you ... obviously I let it get a little beaten up since then!